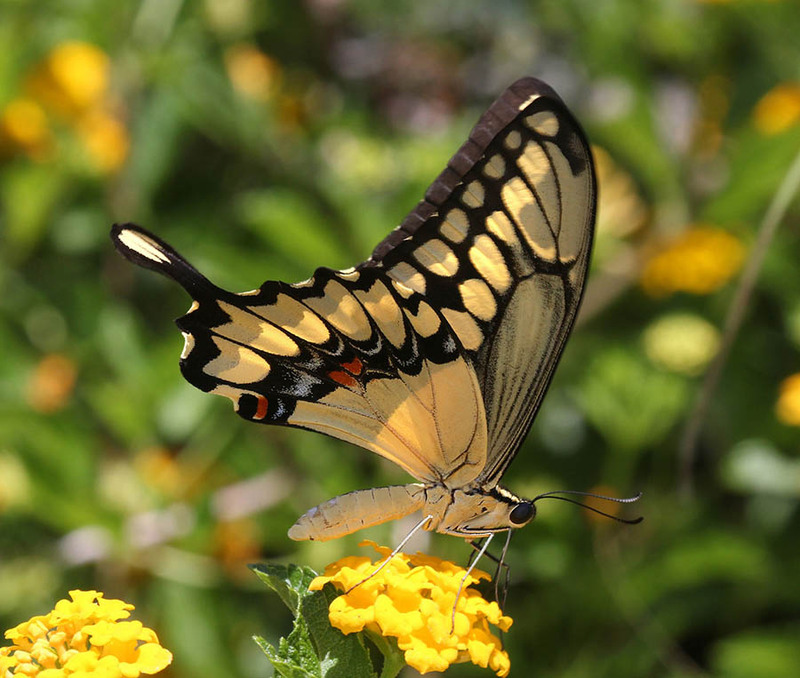 There are over 550 swallowtail species worldwide, and six of them live in the Kansas City area. You can support them by planting gardens to feed them at every stage of life, starting with the caterpillars. 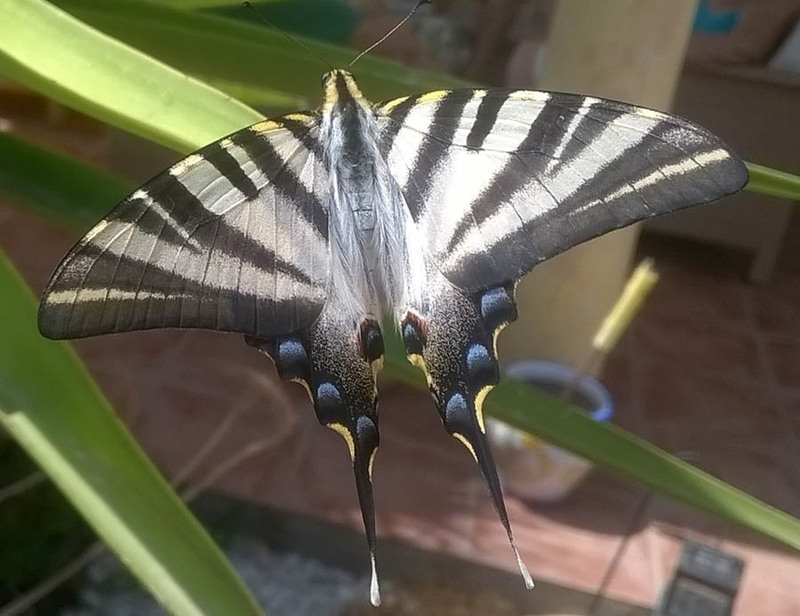 These six swallowtail butterflies are looking for the plants listed below to lay their eggs. 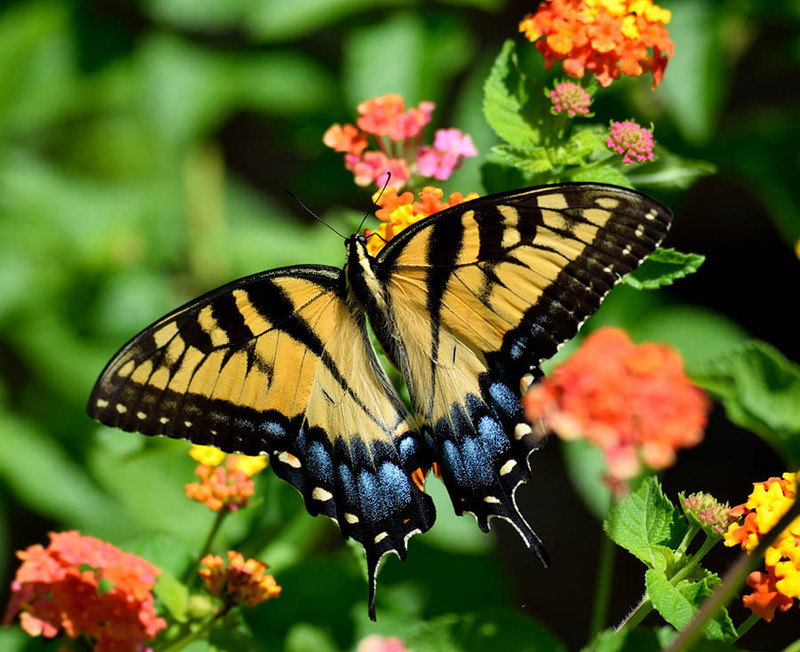 If you plant them, chances are good you’ll see these swallowtails in your garden. Include great nectar flowers and you’ll have happy butterflies hanging around all season. One of four black swallowtails in the Kansas City area, this one tastes bad and might even be toxic to some predators. Small rounded leaves are highlighted with striking silver veining and covered all summer with 1" long, yellow and brown flowers that look like little pipes . The only ornamental downside is that Aristolochia is a delicacy for pipevine swallowtail butterfly larvae in midsummer...less foliage, but more butterflies! Spring and summer broods look a little different in size, and summer butterflies have fewer red spots. Zebra swallowtails have shorter “tongues” and so require blooms with shorter necks for nectaring. Black swallowtails benefit from the pipevine swallowtail’s reputation among predators for toxicity. This common butterfly is fun to raise. High in Vitamins A and C, and iron. In addition to having a distinctive fresh flavor, parsley is also a favorite butterfly host for the black swallowtail butterfly. Technically biennial, plants often return for a second season and bolt with flower clusters followed by seeds. Choose from curly-leafed variety and Italian flat leaf, which grows taller with glossy, dark-green leaves preferred by some cooks for a sweeter, more robust flavor. Grow extra for the butterflies! Delicious, easy to grow, tangy dill provides both seeds and greens to flavor many foods. This variety blossoms early with large seed umbels and foliage for pickling, and is the most widely grown. 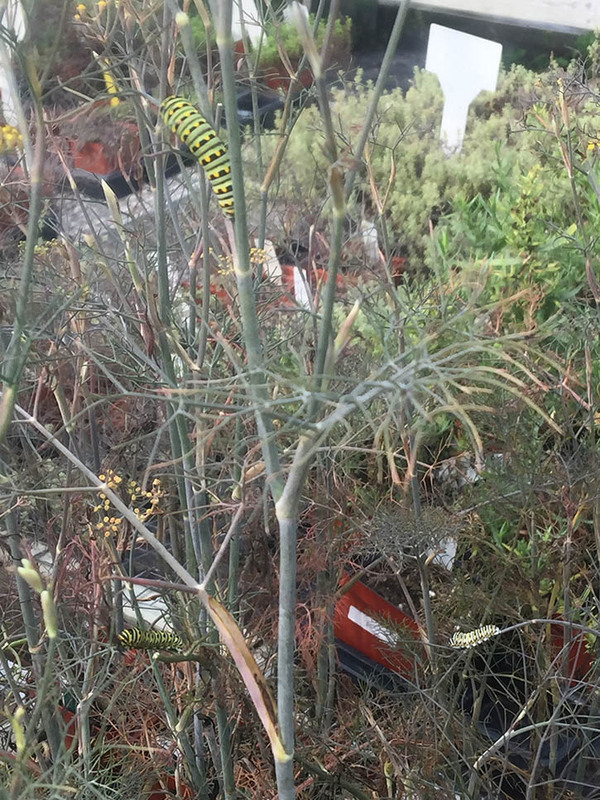 Plant some for the butterflies! 'Fernleaf' is a cultivar growing only 18" tall with abundant dark blue-green foliage. Very slow to bolt. 1992 All-America winner. Use dill in soups, salads, breads, pickles, fish, and salt-free herb seasoning blends. Self-seeding annual. Leaves make a flavorful addition to salads, cole slaw, and dressings. Plants produce seed the second year after overwintering. The delicate, ferny foliage adds wonderful ornamental texture contrast, and the dark bronze variety mixes beautifully with green and golden foliages. Harvest bulbs the second year to allow crop to increase. Males are always yellow, but the females of this butterfly can be yellow or black. Tulip trees are fast growers, often measuring growth of more than 2' per year. Tulip-shaped flowers with greenish-yellow petals and a splash of orange in May and June make a striking show, followed by vibrant yellow foliage in the fall. This native tree provides food in many forms for many animals, most notably the Eastern Tiger Swallowtail butterfly. One of the most favored grown or eaten anywhere, ‘McIntosh’ apples are soft, sweet and juicy. Ripens early to mid-September. Self-fertile. Good pollinator for ‘Cortland’. ‘Red Delicious’ produces medium-sized, striped to solid red fruit. Light yellow, crisp and sweet flesh. Fresh eating and salad variety. Semi-dwarf (12-15’ tall, 14’ wide). Late blooming. Pair with ‘Yellow Delicious’ or ‘Honeycrisp’. ‘Honeycrisp’ has it all — flavor, crispness, and a storage life of up to 7 months. Mid to late season apple ripens in late September. Considered one of the best. Plant with ‘Red Delicious’ or ‘Yellow Delicious’ for cross pollinating. ‘Yellow Delicious’ produces medium-sized, bright golden-yellow fruit. Firm, crisp and juicy flesh. Good for fresh eating and cooking. Semi-dwarf (12-15’ tall, 14’ wide). Late blooming. Pair with ‘Red Delicious’ or ‘Honeycrisp’ for pollenizer. ‘Cortland’ produces large red apples are extra juicy, with tangy sweet-tart flavor. Excellent in fresh salads, as flesh does not brown after cutting. Good eating, canning and pie apple. Ripens in mid to late September. Plant with ‘McIntosh’ for pollenizer. ‘Winesap’ is an old apple cultivar of unknown origin. The apples are sweet with a tangy finish. It can be used for eating, cooking or making juice. It is very resistant to mildew. dark red, round and medium sized; the skin of this apple is firm, and the flesh is crisp and exceptionally juicy with a creamy yellow hue. ‘Winesap’ apples are highly aromatic with a balanced sweet-tart taste and get their name due to their distinctive spicy wine like flavor. Pair with ‘Cortland’, ‘Honeycrisp’, ‘Gala’ and ‘Granny Smith’. ‘Fuji’ was developed in Japan, but is an all-American cross of ‘Red Delicious’ and ‘Ralls Janet’. A very attractive modern apple, crisp, sweet-flavoured, and keeps well, which is they they are often available in the grocery store. A self-fertile variety. ‘Gala’ apples were discovered in 1934 in New Zealand and made their way into the U.S. market in the 1970s. Fruit is pale golden yellow with red stripes, with a firm, crisp interior that is mildly sweet and vanilla-like. Has a thinner skin than most. Self-fertile, but plant with ‘Winesap’, Cortand’, ‘Granny Smith’, ‘Honeycrisp’ and ‘Red Delicious’ for cross-pollinizing. ‘Braeburn’ apples were discovered in 1952 as a chance seedling growing in a New Zealand orchard. The parentage is unclear, but both ‘Lady Hamilton’ and ‘Granny Smith’ apples were growing on nearby trees. Produces medium-sized yellow fruit. Self-fertile. ‘Granny Smith’ apples originated in Australia in 1868 when Maria Ann (Granny) Smith found a seedling growing by a creek on her property and found the light green fruit to be great for both cooking and snacking. Self-fertile, but production will increase if planted with ‘Yellow Delicious’ and ‘Gala’. This native ranges from southeastern Canada through the eastern US, and west to Texas. White flowers open after the glossy leaves have emerged, and dark red fruit changes to black from August through October. Fall foliage is yellow. According to the Lady Bird Johnson Wildflower Center, the fruit of the black cherry tree is eaten by 33 species of birds and many mammals, and is a larval host to Eastern Tiger Swallowtail, Cherry Gall Azure, Viceroy, Columbia Silkmoth, Promethea Moth, Small-eyed Sphinx Moth, Wild Cherry Sphinx Moth, Banded Tussock Moth, Band-edged Prominent, Spotted Apatelodes. NATIVE TO THE EASTERN HALF OF THE U.S. AND WESTERN CANADA. Large, multi-stemmed shrubs have aromatic twigs and foliage. Spicebush is an important native plant for birds and a larval host plant for the spicebush swallowtail. Male and female flowers occur on separate plants, and the females have bright red fruits in fall. NATIVE TO THE EASTERN HALF OF THE U.S. Native to the southeastern US and north along the Atlantic coast to New York. In the northern part of its cultivated growing range, it typically grows 15–20’ tall tree with a spreading, rounded crown. It has no serious insect or disease problems, tolerates clay soil, wet soil, air pollution, and prefers sun to partial shade. Hardy to zone 5. Their larval host plants are less common, so these butterflies are also fewer in number. Plant spicebush and pawpaw and you just might find them in your garden. Trees have three distinctly different 3-5” long leaves: three-lobed, mitten-shaped, and simple, that turn red, yellow and orange in fall. Grown as understory beneath larger trees like eastern white pine, sweetgum, oaks, black cherry, American beech, American hornbeam, and eastern red cedar, Sassafras will stay shrubby. These allelopathic trees will stunt some species such as American elm, allowing it to grow without so much competition where it can reach a height of up to 60’. Larval host plant to Eastern Tiger Swallowtail butterflies, Sassafras is also an excellent wildlife food source for many species of birds and mammals. NATIVE TO THE EASTERN HALF OF THE U.S.
Caterpillars resemble bird droppings as a smart defense from predators. In citrus growing regions they can become a pest — cats eat foliage of citrus trees. Lacy blue-green ornamental herb is known as the “herb of grace.” Rue was once thought to cure a wide range of ills, but is now grown mostly as an ornamental and insect repellent. It’s bitter flavor is used in cooking only in northern African foods. NOTE: Some people have skin sensitivity to this plant that can resemble a poison ivy blistering.